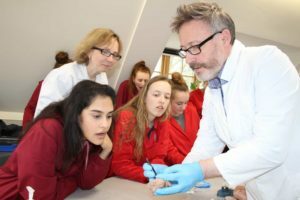 For a second year running, Dr Guy Sutton of the University of Nottingham Medical School conducted a one-day tutorial, for Prior’s Field Upper Sixth Biologists and Psychologists, in Neuroscience. An intensive day, students spent time considering such aspects as nerve cell function, the role of genes in the brain, brain anatomy (in humans and across species), the damaged brain, methods for studying the brain and cause and treatment of mental illness. Dr Sutton went on to deliver an evening lecture to a fascinated audience of parents and Sixth Form students, on the subject of ‘Mind and Brain in the 21st Century’. Dr Sutton dissects a sheep’s brain. Sixth Former Bethan reported on ‘Brain Day’: ‘Upper Sixth Biologists and Psychologists spent the day with Dr Guy Sutton, Director of independent consultancy Medical Biology Interactive and Honorary Lecturer at the University of Nottingham Medical School. During ‘Brain Day’, we learned about how the different structures and functions of the brain influence our behaviours, including how both genes and the environment affect the way our brain works. We studied how the brain is able to adapt and change following injuries through plasticity and functional recovery, including ways of investigating the brain through fMRIs and Electroencephalography (EEG). Mrs Allen inspects the sheep’s brain. A model of the human brain and a sheep’s brain. A student helps with the brain dissection. Dr Sutton dissects parts of the sheep’s brain. After lunch, we learned how brain injuries are able to affect crime, considering prisoner Donta Page who had a frontal lobe dysfunction. Following this, we learned about psychopathology and how mental illnesses were treated many years ago, through using trephination (cutting holes in the skull) and psychiatric asylums. We then watched Dr Sutton dissect a sheep’s brain, showing us what all the different areas in the brain were responsible for. Sixth Formers attend Surrey University STEM Programme on International Women's Day.